Miles is the official mascot of the Denver Broncos. This was a request from another one of my co-workers along with Fredbird, the official mascot of the St. Louis Cardinals. And before any comments, the picture with the posting has a number 1 on his Jersey whereas the pattern creates the number 00 on the Jersey. Number 1 was what my co-worker requested whereas Miles usual Jersey has number 00 on it. Worsted weight yarn: White, navy blue, and orange. Rds 10-22: sc in each sc around. Finish off. Stuff SHOE AND LEGS firmly. Using orange, lace the SHOES. Rd 2: Holding next sc on BODY and sc #3 of RIGHT LEG together and working through both thicknesses, sc in next 3 sc, sc in next sc on BODY, holding next sc on BODY and sc # on LEFT LEG together and working through both thicknesses, sc in next 3 sc, sc in next sc on BODY. Rd 20: sc in next 5 sc, sc2tog, sc in next 4 sc, holding next sc on BODY and sc #10 on RIGHT ARM together and working through both thicknesses, sc in next 4 sc, sc in next 5 sc on BODY, sc2tog, sc in next 5 sc, holding next sc on BODY and sc # on LEFT ARM together and working through both thicknesses, sc in next 4 sc. Rd 21: sc in next 4 sc on BODY, sc2tog, sc in next 4 sc, sc in next skipped sc on RIGHT ARM, working in sc behind same arm, sc in next sc, ch 2, skip next 2 sc, sc in next sc, skip next 4 sc on same arm, sc in next sc, sc in next 4 sc on BODY, sc2tog, sc in next 5 sc, sc in next skipped sc on LEFT ARM, working in sc behind same arm, sc in next sc, ch 2, skip next 2 sc, sc in next sc, skip next 4 sc on same arm, sc in next sc. BEGIN STUFFING BODY FIRMLY. CONTINUE STUFFING BODY AS YOU GO. Finish off leaving a long tail. Weave tail through sc of Rd 40, pull tightly, and secure. Weave in ends. Rd 5: Holding MUZZLE TOP and MUZZLE BOTTOM together and working through both thicknesses, sc in each sc around. Finish off leaving a long tail. Sew MUZZLE to head of BODY. Embroider EYES and NOSTRILS on DENVER BRONCOS MILES. Finish off leaving a long tail. Sew EYEBROWS on head of DENVER BRONCOS MILES above eyes. Finish off leaving a long tail. Fold top of EAR down and sew EARS to head of BODY. 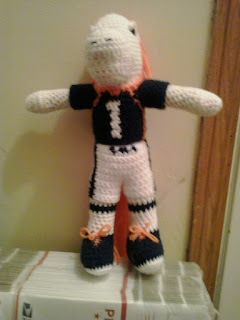 Fringe on 9- inch pieces of orange yarn starting at top of head and working down back of head. Rw 10: Ch 1, turn; sc in next 2 sc, change to white, sc in next 2 sc, change to navy blue, sc in next 6 sc, change to orange, sc in next 2 sc, change to navy blue, sc in next sc, change to white, sc in next 2 sc, change to navy blue, sc in next 4 sc, change to white, sc in next 2 sc, change to navy blue, sc in next sc, change to orange, sc in next 2 sc, change to navy blue, sc in next 6 sc, change to white, sc in next 2 sc, change to navy blue, sc in next 2 sc. Rw 12: Ch 1, turn; sc in next 6 sc. Rw 11: With wrong side facing, skip next 5 sc, attach orange with slip st in next sc, ch 1, sc together the same sc as slip st and next sc, change to navy blue, sc in next 8 sc, change to orange, sc2tog. Rw 13: Ch 1, turn; sc in next 6 sc, ch 5 (ARMHOLE MADE), sc in next sc of CENTER, change to orange, sc in next sc, change to navy blue, sc in next 2 sc, slip st in next 2 sc, sc in next 2 sc, change to orange, sc in next sc, change to navy blue, sc in next sc, ch 5 (ARMHOLE MADE), sc in next 6 sc of LEFT SIDE. Change to orange. Rw 14: Ch 1, turn; sc in next 6 sc, sc in next 5 ch, sc2tog, sc in next 2 sc, sc over next 2 slip st, sc in next 2 sc, sc2tog, sc in next 5 ch, sc in next 6 sc. Finish off leaving a long tail for sewing back seam closed. Finish off. Weave in ends. Repeat in second ARMHOLE just reversing the order of the stitches. Place SHIRT on DENVER BRONCOS MILES and sew back seam closed. Finish off. Repeat PANTS LEGS pattern in the second PANTS LEGHOLE. Place PANTS on DENVER BRONCOS MILES and sew PANTS LEGS seams closed and back seam of PANTS closed. Fringe on 18-inch pieces of orange yarn to back of PANTS. Miles and Denver Broncos’ logo are copyright Denver Broncos and National Football League and their respective creators. This crochet pattern is an original pattern and is © by Christjan Bee (June 2018). Please do not claim this pattern as your own. If you wish to share this pattern, you may link to this pattern but please do not reprint/repost it on your site. You may print and keep a copy for your own personal use but you may not sell or distribute it, or sell items made from this pattern.